Mostly cloudy skies early, then partly cloudy after midnight. Low 43F. Winds NNW at 5 to 10 mph..
Eight-year-old Zachary Demarest plugged in a string of Christmas lights, and then, one-by-one, unscrewed and replaced the ones that didn’t glow. His 4-year-old brother, Benjamin Demarest, helped out and their mom, Joan Demarest, performed some of the trickier tasks. “The big adventure is using needle-nosed pliers to screw off the ones that have broken off,” she said. The tedious work will pay off when tens of thousands of colored lights illuminate a route at the Benton County Fairgrounds from the parking lot through the livestock pavilion in an elaborate drive-through Christmas display. This year the beloved community tradition, which was launched by the late Mario Pastega at his Corvallis Pepsi bottling plant in 1981, has not only been relocated but rescued from disrepair: Pastega’s children and more than 150 community volunteers have completely revitalized the Christmas display. “The kids who come through here will be mesmerized by the beauty and the lights,” Ken Pastega said on Saturday, smiling wide as he surveyed the progress. 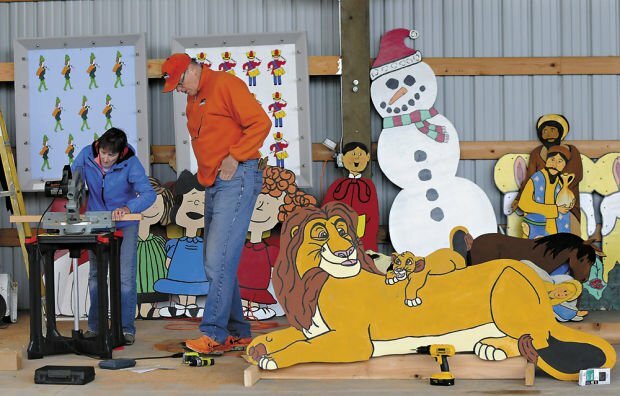 Volunteers hung decorations from a bucket truck, zip-tied lights to newly painted cartoon and storybook characters, and built wooden supports so that decorations historically staked to the ground would stand upright on the concrete floor. Ken Pastega’s father, Mario Pastega, sold his Corvallis bottling plant to PepsiCo in 2011 with the understanding that the company would continue to mount the light show every year. But last Christmas — the first since Pastega’s death in January 2012 — company employees who volunteered their time to set up the display acknowledged they were struggling to keep the lights blinking, the paint fresh and the mechanical decorations functioning properly. So Pastega’s family — sons Ken, Gary and Denny and daughter Lisa Altig — took back the display, relocating it to the fairgrounds. In addition to supplies, the Pastegas purchased an old bucket truck to hang decorations, a hauling truck and three trailers to store and transport the decorations. Families, service organizations, Eagle Scout hopefuls and businesses immediately responded to a June newspaper article calling on community members to volunteer to “adopt” one of their favorite scenes — repaint, rebuild or replace parts as necessary to give them new life. A new location requires that the display’s layout be different, Ken Pastega said, but it will maintain some of the integrity of the traditional design. CH2M Hill employees, Karen Aquino and Mike Schweizer, used engineering software to create a detailed blueprint so that nothing is laid out haphazardly. The Rotary Club of Greater Corvallis has provided the bulk of the setup labor, volunteering for work parties last weekend and this weekend, with the plan to finish up next weekend. The free drive-through Pastega Family Christmas Display will open to the public on Friday, Nov. 29, and be open nightly from 5-10 p.m. through Christmas at the Benton County Fairgrounds. Gazette-Times reporter Bennett Hall contributed to this story. Reporter ​Canda Fuqua can be reached at 541-758-9548 or canda.fuqua@lee.net. Follow her on Twitter @CandaFuqua.